The Rushville Hose Company was organized in 1905 with 25 active members and 15 honorary members. Its first fire chief was Dr. Halstead and the Company’s first fire truck was on a Model T chassis. The fire equipment was housed on private property until 1936 when the current day Village Hall was remodeled to encompass the Fire Department in addition to the Village Offices. Throughout the years, the Village Hall was remodeled several times to accommodate for trucks and equipment. In 2006 a new fire station was built on Railroad Avenue which alleviated all space and functional issues that were faced at the Village Hall location. Today the Fire Department has a four truck bay, 6,000 square foot fire state with a full kitchen and dining hall. The very dedicated members put in countless volunteer hours constructing the fire station and due to their efforts the community has a very nice facility to be proud of. The Fire Department’s call log has expanded and grown in numbers over the years. When first formed the Department responded to calls related to structure fires however today the Department responds to a very diversified type of calls ranging from EMS service, ice rescue, motor vehicle accidents, security alarm responses and odor investigation in addition to the traditional structure fires. The Department still maintains between 20-25 active volunteer members and is always looking for more help. If you are interested in serving the Village of Rushville and surrounding community please see the forms and applications link on this website for a membership application, stop by the fire house most Tuesday nights to pick up an application or contact the Company President. For many years the Rushville Fire Department has been providing emergency services to our community. This protection has been professionally performed by dedicated volunteers who take great pride in ensuring that our neighbors enjoy the absolute best safety and comfort they deserve. However, as we strive to protect you, we are looking for some help - your help! The Rushville Fire Department is a volunteer department that operates out of its fire station on Railroad Avenue in the Village. The department’s volunteers are composed of men and women who donate thousands of hours per year to help their neighbors, many of whom they have never met. The firefighters are typical citizens who want to “give back” to their community; they take time from their personal lives to train to be the best firefighters they can be. Most people who choose to get involved with the Rushville volunteer fire service enjoy it. The friendships that are made will last a lifetime. We call it a family; brothers and sisters working together to help those in need. 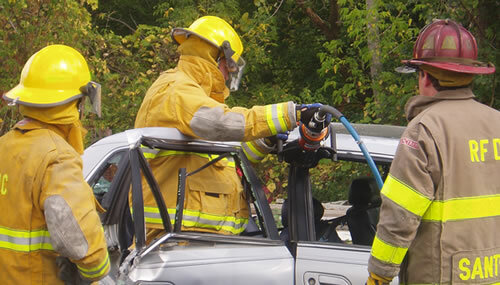 We have many different roles for citizens to help with: assisting with fire prevention and education work, helping with administrative work, driving the fire apparatus, operating water pumps, assisting with traffic, operating the jaws of life, and of course, performing interior firefighting. All of these roles, individually or cumulatively, are equally important to us. We are excited about sharing the opportunities that exist for you and how you can contribute to our organization. The Department is seeking volunteers and all training will be provided. If you would like to learn more about how you can contribute, please feel free to stop by the firehouse at 14 Railroad Avenue on most Tuesday evenings at 7:00pm for more information. We look forward to getting you started on a rewarding journey that will offer countless opportunities. 1991 Pierce Lance Heavy Rescue with 25kw PTO driven generator, 4 bottle cascade system, and rescue tools. 1997 Pumper Tanker with 1000 gallon pump and 1250 gallon storage.